Sometimes we get sent the strangest photos without context, and it’s necessary for us to figure out what the hell is going on. Yes, that’s GOP Senate President Kevin Grantham, and yes, it looks like a mug shot. 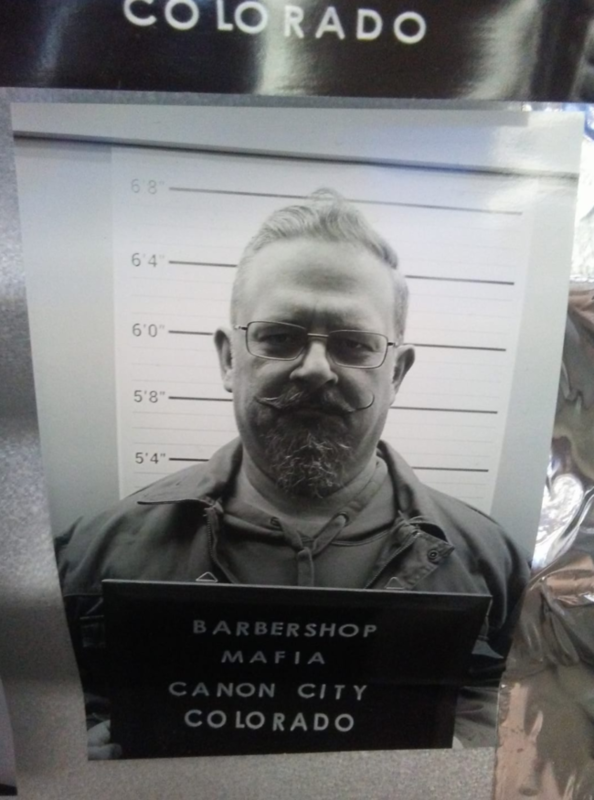 In fact, it’s Grantham’s gag photo from a popular barbershop in Cañon City–perhaps the same place where Grantham discovered the revamped ‘stache he sported for the last few months of his political career. Of course, this is the same Kevin Grantham who announced this year that only criminal cases of sexual harassment matter in the Colorado Senate, as opposed to the usual workplace standards! So maybe he’s just modeling a new look for the “Randy” caucus he leaves behind. Trump supporter discovers time machine, travels to 1850 for shave and a haircut. Cost? Two bits. Evil Bartender apprehended as accomplice to Billy The Kid. Sadly, first-degree dickishness is not a crime. Pretty sure he can "handle" being behind "bars."